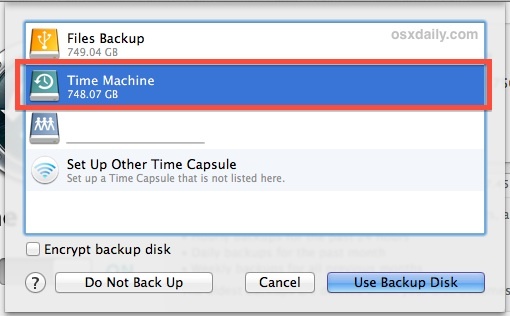 Having regular backups of your Mac is a necessity, and there is really no easier way to consistently back up your Mac than by using the excellent Time Machine feature of OS X. But with the enormous size of external hard drives and their prices becoming cheaper and cheaper, it’s not always necessary to dedicate an entire gigantic hard disk just for Time Machine backups, particularly if your Mac has a smaller hard drive and thus the backups won’t take up that much space in general. For these situations, configuring the single external hard disk to have dual use is an excellent choice. The end result will be an external storage drive split into two partitions, one to be setup exclusively for Time Machine backups, and another partition intended for typical file system access and file storage. The basic process may be familiar to Mac users who have setup drive partitioning and backups before, but we’ll cover every step to be sure everything is configured correctly. Note on buying external hard drives: it’s almost always cheaper to buy a generic external hard drive and format it yourself to be Mac compatible. Drives that are pre-formatted for OS X are usually no different than a standard external drive, other than having a higher price tag. The first set of steps involves formatting the drive. You can partition a drive without formatting, but we’ll cover this process anyway because many third party hard drives ship with Windows-centric FAT32 or NTFS file systems which, while they are compatible for dual use with both Mac and Windows, are not compatible for using as a Time Machine drive, and as they are not exclusively formatted for the Mac, will have other limitations which are not desirable for exclusive Mac OS X usage. This process will erase all data on the hard drive, meaning this is best to pursue when you first get a new external drive for backups and file storage. How long it takes to format a drive depends on a variety of factors, including drive speed, interface speed, and total disk size. Just let the process go, don’t be surprised if it takes a few minutes. Next we’ll set up the external hard disk to have two separate partitions, one for the Time Machine backups and the other for regular file system access. A quick note about sizing: It is good practice to set the Time Machine drive to be at least 2x-3x your primary hard disk size. For example, if the Mac has a built-in 128GB SSD drive, setting the Time Machine partition to be at least 384GB or larger would be ideal. 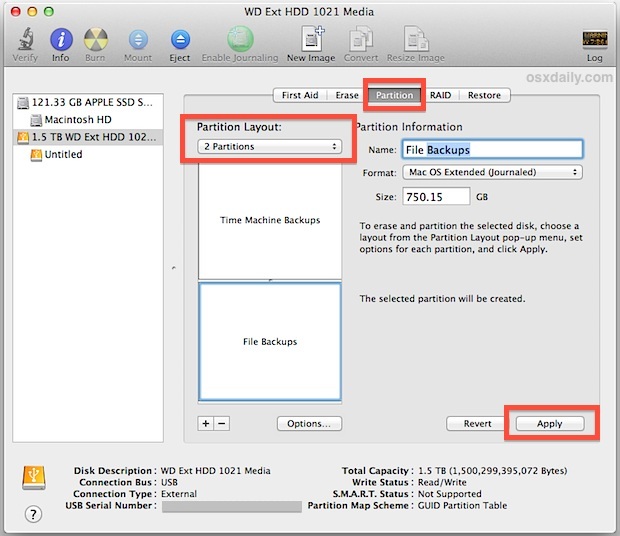 You can certainly get away with smaller sizes, but because Time Machine takes incremental snapshots of the data on your Mac, the backups will simply capture more data for a longer period of time if the partition size is larger. To be clear, backups will not stop once the maximum space is reached, it will simply rewrite older backups, thus preventing access to old drive states as they become rewritten. We’re going to use an even 50/50 partition scheme for this example (specifically, a 1.5TB drive split into two 750GB parts) though you can configure yours as appropriate. Partitioning a drive can take a few minutes, depending on the total capacity of the disk. Once that process is finished you can quit out of Disk Utility. 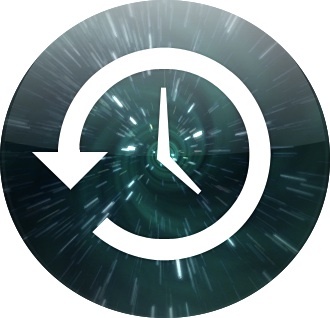 With the most technical aspects now finished, you can specify the partition to become the Time Machine backup. This will also initiate the first backup of the entire Mac with Time Machine, which is usually the lengthiest backup since it’s going to back up every single thing. While you’re in the Time Machine settings, you can choose to encrypt the backups by checking the appropriate box (yes, you can encrypt them later if you change your mind), and you can also exclude files or folders from the backups through simple drag and drop specification by way of the “Options” button if desired. The default configuration remains unencrypted and excludes nothing, which is satisfactory for many use cases. Again, the first initial backup process will take quite a while since the entire Mac is being backed up. Let the entire process run through its course, this may be best done overnight if the primary Mac hard drive is enormous since it can several hours to perform the initial backup. Backups performed after the initial sequence will be much faster and smaller, because they will be delta backups, focusing on files that have been added, deleted, or changed from the Mac, rather than just copying the entire drive and it’s untouched contents over and over again. Now that everything is setup you will have one partition automatically serving as the backup drive, and the other accessible as usual through the file system for general file storage of things like movies, large video collections, pictures, media, downloads, or whatever else. How to differentiate between the two drives? Other than the obvious name differences that were specified during configuration, you’ll discover the icons serve as an indicator of which partition/drive does what purpose. The normal file system storage partition will have a standard orange external drive icon, and the Time Machine partition will have a green icon with the backup logo on it. Accessing the standard file system partition is done through any Finder window, where it will appear in the sidebar under “Devices”, or if you have drive icons set to show up on the desktop, it will appear there. Once format to Mac OS Extended Journaled will the storage partition work on a pc? eg. I want to transfer music files from my mac to a pc or vice versa. Basically will the hard drive work on a pc? or do i have to re erase the general storage partition and reformat as FAT32? Basically just reformat the storage partition to NTFS and it’s good to go. Thanks for the article. 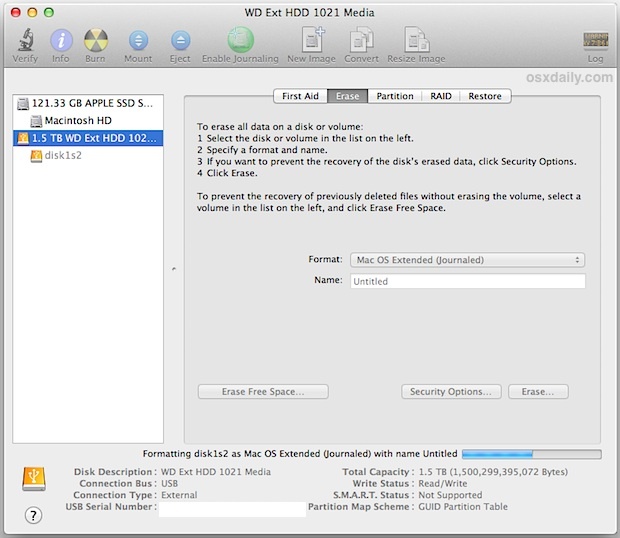 I recently got an external HD for my Mac and I was wondering for a bit about this…is it necessary that we split it into two partitions? Can we just create another folder in the 1 Partition HD…? I only ask this as I already did it, but wondered if it by chance hinders anything. Sure that’s fine, but it’s cleaner to use a separate partition and helps eliminate any accidental overwrites, etc. You can always create another partition and copy that folder over to it, just takes a few seconds. Ah, so there’s no need to reformat it then? Hi, following up on Jake’s question, if I reformat the storage partition to NTFS then I can use both a mac and PC to save and get files from the storage partition part of the drive? I got a seagate central that says it supports Time Machine and right now before partitioning I can use both a mac and PC to save and get files. Can I just not reformat it when I create the 2 partitions (1 for time machine back up and the other 1 for storage)? Excelent, clear and very complete! Hi. Firstly, thank you for the article. I would appreciate some advice. I have purchased a 2 TB external HDD for time machine backup and thought I would use some of the that space as storage of my movies, photos, and music. My MacBook has a 750 GB capacity, and I have used ~500 GB, of which ~350 GB is media. I will keep all that on the external HDD, and not on the Mac drive. Will a 50/50 partition of the drive be adequate for time machine, with my used capacity going to be closer to 150 GB, and not likely to increase significantly in the near future? Thank you. Is it possible to partition after setting up the drive for time machine. I have only done the initial backup but I need to free up some space on my internal drive as well. And if so, can I get time machine to backup my storage partition as well as my internal drive? Thank you so much! Excellent article; very helpful. this was so incredibly helpful! appreciate the really detailed walk-through so much! @Jake – just to add to what Clive said, if you have 32 bit Windows XP you must use Master Boot Record (MBR) as the partition map as it does not support GUID table. Click on options in the Partition tab to select this option. @DQ – I had a WD USB HDD which I formatted in windows to NTFS. I could read the files on my Mac but the whole drive was read only. So when I partitioned the drive I formatted the storage partition as FAT (after selecting MBR as partition table as I still use Windows XP). This is read/write on both mac and windows. @Tephilla – You need to remove storage from ‘Exclude these items from backups’ ‘Open time machine preferences…’ -> Options. You might be able to use a non-destructive partitioning tool to create a second partition once you’ve already backed up but I’ve not tried this myself. I don’t usually comment on stuff like this, but this was incredibly helpful! I am new to Mac and this made ‘learning the switch’ from PC to Apple all the more easy & fun. Can this second partition for file storage be backed up via the Time Machine as well? I have so many photographs and I want to move them from my main drive to a backup drive but of course, I still want them to be backed up. If this is not the best method, would you mind pointing me in the right direction? Thanks! Is it possible to back up my pc to Time Capsul on a dual partition? like i have a 1T for my Mac and want my other partion for my PC back up…is it possible? Sure, have another partition set up as NTFS or FAT32 and use your Windows backup app on that partition. Do not try to use the Mac Time Machine app to backup to the Windows partition, or vice versa though! What’s the real difference between back up the computer and copy the files? Does The Time Machine work only with external drives? can you use time machine without it? If T.M. is set in automatic…do I have to connect my external hard drive to do the back up every single time? How does Time Capsule works? I have followed these instructions but have hit a snag. Do you want to replace the backup disk “My Passport for Mac” or back up to both disks? If you use both, time machine will take turns backing up to my passport for mac, and time machine backups. Cancel, replace my passport for mac or use both. My advice is never have your general file storage on the same external backup drive as your Time Machine. Always have at least two external drives – one for TM, the other for manual backups. Reason is that I’ve had a few ‘dodgy’ external drives in the past. If not for the fact that i had a secondary backup, all would’ve been lost. Can I use the same time machine/hard drive for another mac? Great to have Time Machine working hard, without it slowing down the OS. Thank you for another valuable how-to-lesson! Thankyou for you easy to follow instructions. It’s great to know there is people out there who wants to help. Hey, this was super helpful! Thank You. I have two partitions on my external hard drive. I do not get the partition named ‘Time machine…’ I just get the name of my external drive. Thanks for this! I’m glad I bothered to look for this or else it could’ve been a huge waste of time/money and it was super easy to understand. I’m not a well seasoned mac user! I have a 1 TB external drive with Time Machine backup from a previous MacBook. I want to use the remaining space (about 700 GB) for TimeMachine backups of my new MacBook Air. I need to keep the about 230 GB of the previous backups that I cannot share with the new machine that has only 120 GB of HD space. Can I create a partition that is compatible with my interests? I’m just curious, why would you bother to partition a drive? Time Machine creates a “backups.backupdb” folder which it seems to “know” is where it always puts the TM files. Other folders live happily on the same drive – never interfering with each other! Why would you potentially limit yourself by partitioning the drive if you don’t need to? Interestingly, even cloning programs like “SuperDuper” actually know NOT to overwrite the “backups.backupdb” folder, so you can even clone to the same drive again and again if you wish. To sum up, what is the advantage to partitioning? @Paul – there are many benefits to partitioning a drive – for the purpose of this scenario (depending on the external you decide to use) Extended hard drives do not work well with other operating systems because of the read/write abilities (i.e. : NTFS format on Mac OS machine).. Time Machine only works on a Mac OS volume which is not compatible on a windows PC so people that have larger drives that they want to use for multiple purposes (backups & files) & on different operating systems… this allows you to partition a drive to be formatted to work only with MAC as required with TM… that way the second partition can be used strictly for FAT32 or Exfat formatting – that way you have read/write functions on both Mac & PC… & not to mention if you don’t have a second partition then TM will use the entire space for backups which doesn’t allow room for personal files (over time) so this partitioning has different benefits for each user… For me, i have two partitions, one strictly for Time Machine & a second strictly for my important files that is formatted to Exfat (or NTFS in easy terms) so that i can use the drive on my windows PC & Mac plus have the ability to read/write my files on both machines with no restrictions… so if you have no partitions then you’re space will be gone before you know it & you wouldn’t be able to use the drive on other PC… etc! But your reply is useless, because the scenario blog this post is concerned with is using one external HDD for both backup and file storage on the same MAC. It’s simply not practical to use an external hard drive for both Time Machine and File Sharing between a Mac and a PC – even if one is an iMac and another is a Windows Notebook/Laptop. Using a file system other than HPF+ is not that great on a Mac, and using a file system other than NTFS on Windows is not that great. Both FAT32 and ExFAT perform far worse than the native file systems on those OSes. FAT32 being very old technology, and ExFAT not being designed for use in a large disk file storage scenario (it was designed for Mobile and Embedded Devices with far smaller storage volumes). My honest opinion is that for the most part, these backup solutions aren’t nearly as great as they used to be. The versioning in File History/Time Machine is great, but the vast majority of users simply do not need it. I was using it on my iMac (1TB HDD) and eventually turned it off and used it for bare storage (Put my Video Files there and I have a bit less overhead with iMovie and Premiere Elements, because it’s loading the data from a different volume, which improves performance). I do the same on my Windows Machine. Windows is a bit better off because you can use a UHS SD Card for File History. I don’t know if OS X allows you to do that, but you can put the SD Card in your PC and just always keep it there. These types of Backup Programs should only Backup the user Libraries and Settings, anyways. I don’t know why Apple Backups you entire Applications folder. The OS should have a way to restore itself to Factory Conditions built into it, like Windows 10. So even with a 240GB SSD in my Laptop, a 64GB UHS-I SD Card is still enough for a workable File History. Without Time Machine backing up my Application Folder, I doubt it would have 100MB of stuff on my iMac to back up. With the Applications it’s something like 85GB, which is quite a huge waste of space (there are games that I uninstalled that were 25-50GB in size, Time Machine would copy them entirely to the Backup Drive). Hi there! Thanks for the useful guide, but I have one problem: there is nog ‘partition’ tab in my menu, just the four others shown in your screenshot. Any idea why that could be? Oh, never mind, I got it! Is it better to use a drive over a G-RAID drive for what you described in the article? Thank you for the clear and concise explanation and tutorial. I have a 4 TB G technology external HD. It is much bigger than I need but it was a good price and has good reviews. I’d like to partition a portion of this for time machine back-up and another portion for an OS X boot drive. Is that doable? If so, after I repartition the ExHD into two sections, how do I create the OS X boot drive? Thank you for any help you can give. This is the first article I found that is clear. And I’m fairly tech savvy. 1. How do I Time Machine my Mac whose 1T HDD is 50/50% partitioned for Mac Os10.11, and as a Boot Camp Partition, (Win7pro), which ran my business apps. The Mac side also has a fully working Fusion 7:/Win7P, same PC APPS. But I use The boot camped windows os exclusively. 2. My other IMac’s HDD, was a 100% Mac clone of the Mac side of the Mac in question 1. It ran the same PC APPs in Windows7pro, inside of Fusion7. Its Hdd died. I have installed a new virgin HDD. -what is the best way to install a new clone of the Mac side only of the Mac in question 1? ( will a Time machine backup install on the other iMacs new, empty, HDD? Any other suggestions! The App Store will only download Sierra, but Fusion does not work with that yet; so it’s either 10.11 or 10.10. – I tried 1 time machine restore and it did not boot after all files were transferred. – must I do a Net Restore to the original earlier OS X, then try the TM RESTORE to get that to become bootable? – I originally installed an earlier clone of OS X, Fusion, w7, and my PC apps WHEN I got the iMac in 2011. To bad the hdddied after 5 years. I did not TM THIS ONE, only the other dual boot Mac , bec it was the PC Server with all the PC data contained on that. Thanks for information. Will this work as a NAS as well? Hi, I followed steps 1 to 4 and it has completely erased the drive. So much so I can no longer find it on the Mac. Then you can make a new partition to split one for Time Machine and one for files if you want. Hi, I just bought a Toshiba 3TB external hdd and was having major issues with dragging/dropping files to the drive and even the smallest taking hours, I then read somewhere that it’s best to have Time Machine on it’s own partition but I wasn’t sure how to do it, after reading your very clear instructions it’s all done and dusted in a matter of minutes, so THANK YOU very much! I do have one thing to add which might help others’ if they come across this issue; after erasing the data you saved on your new hdd you might find the partition button is greyed out. Check the hard drive you have selected in DU is the one with the model number – not the one that might be below showing the name you first gave the drive. Clicking on the model number line should ungrey the partition button, well that’s what did it for me! Thank you very much for your article. It is most helpful.Cheers! I have a 2015 macbook pro running os sierra 10.12.6. with very low memory, so I usually don’t keep many personal files actually on the computer, but regularly transfer them into an external instead. I bought a 2tb WD My Passport external hard drive that I set up and encrypted through WD software. I used this external to save pictures, videos, work docs, etc. as my old HD for some reason suddenly stopped being “compatible” without reformatting and erasing all my old info after an os update, so I went through all the backups to manually save all the above types of files to this new drive and have since been adding to them until I could figure out a solution to start doing regular time machine backups again. I recently decided to set up time machine to start backing up my computer on this drive after an internal HD wipe scare, and forgot to partition it first and do more research regarding the process of protecting the original files I had already saved to it. I was very rushed and have been so overwhelmed with work and kids, that I wasn’t really thinking and for some dumb reason decided to also encrypt it through time machine when prompted while setting it up. It just finished doing the initial backup/encryption process and now seeing it in the finder window, I see that all my original file folders containing all my pictures, work, etc. are all empty, there, but completely empty- I can’t believe I did that… I had tried to also back them all up to iCloud initially when recovering them from the old HD I had, but due to internet unreliability, it was not always successful, even after many attempts, and there is only a fraction of what I had saved on the drive. Is there anyway to undo the time machine encryption and recover all my original files that were previously stored on the drive before, or are they completely gone/unrecoverable? Not finding much help online and crazy waits for Apple Support, so hoping to find a solution sooner. Any help recovering those files is truly and greatly appreciated! Thank you! If you formatted a hard drive and need to recover lost data from it, you’d likely need data recovery software. But if the lost data is encrypted, it will be more difficult to recover. But with that said, even if you use Time Machine on an external hard drive, it should not override any files that are on that hard drive. You can do that without partitioning. Perhaps why you’re not seeing the files is because the backup is encrypted? Or was the data totally erased? So I’m not entirely clear on your problem or the solution, but you may want to reach out to Apple Support telephone number and explain it to them, or go to an Apple Store if possible and they may be able to help. Good luck, let us know what works! Thank you; this is exactly what I am looking for. I have a 2 TB Segate Backup Plus drive. I want to use a part of it for Time Machine Backup and the other partition for normal file backups. My question: If I use the above method, will I be able to the second partition to transfer files between my MacBook Air and other Windows computers? If not, what other method works?